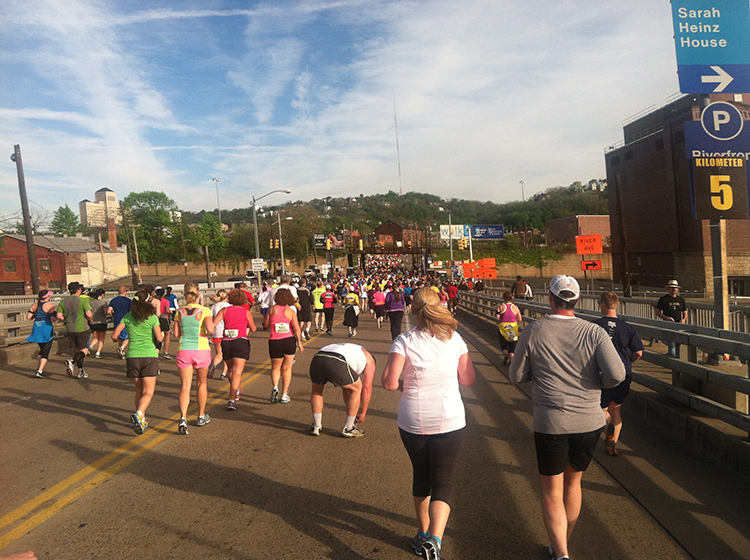 At the end of last year, Jill from Jogging Jeans had the genius idea that Hubby and I should come to her hometown of Pittsburgh to run the Pittsburgh Half Marathon. The promise of a new city plus meeting Jill was too good to pass up (also, I wanted to be able to call myself a Runner of Steel). To add to the excitement, Charla from Running Haiku decided she would join us, stopping over on the way from Seattle to D.C. I had a feeling this was going to be momentous (all it was lacking was Tiffany, from Cute Dogs and Hugs, but she was there in spirit). Apparently Pittsburgh has 446 bridges, and, according to the very reliable Wikipedia, “is the world record holder for brides with piers and stands contained entirely within city limits.” So there you go. There’s a long-running joke between Hubby and me that every time we visit a new (small) city, he will ultimately want to move there. It’s happened with Cleveland (no thanks), Little Rock (no way), and Salt Lake City (maybe). 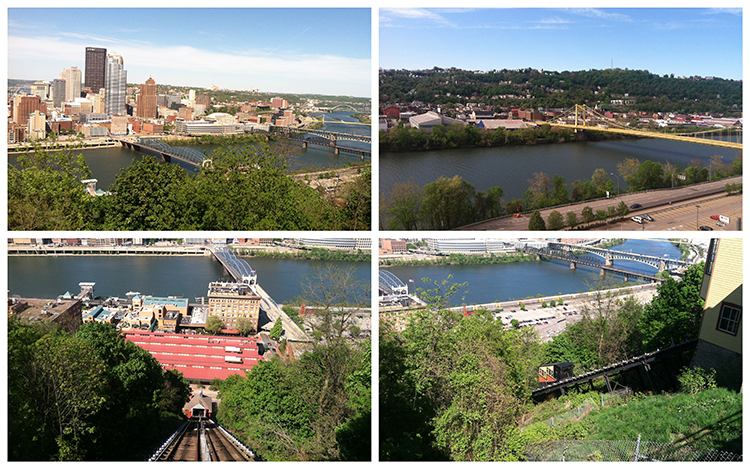 Pittsburgh, on the other hand, is a place I could actually see myself in. 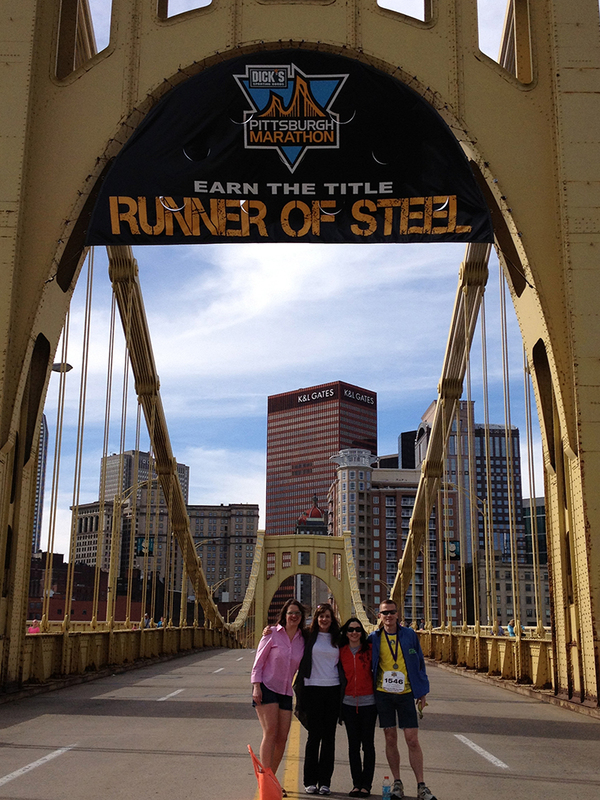 The four of us mentally preparing to be Runners of Steel by standing under a banner. One of the first things Hubby and I noticed when we went to pick up his race packet for the 5K (yes, he did both races; and yes, he did the 5K in jorts) was the presence of flushing port-a-loos by a company called Mr. John. Did I mention that they were port-a-loos that flush? This was nothing short of a revelation and I immediately snapped a photo. We don’t have such luxuries here in New England. Jill clearly thought we were all nuts. Apparently, outdoor toilets that flush are a dime a dozen in her world. She needs to come and rough it with us in Boston for a while. In the summer. 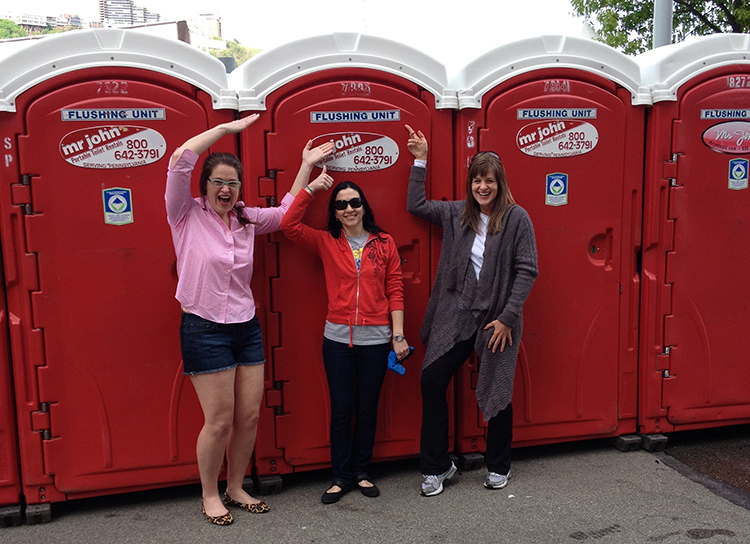 What do running, port-a-loos, and the Pittsburgh Pirates have in common? Nothing, really, unless you are three bloggers and one hubby who happen to wind up at PNC Park sitting next to an old guy who happens to be wearing the shirt from the Pittsburgh 5K that morning, who also happens to be someone Jill met a year before, who also happens to be … wait for it … the owner of a (flushing!) port-a-loo business just outside of Allentown (he and Mr. John have somewhat different business models though). I couldn’t make this stuff up if I tried. His name was Kenneth, and for any Aussies reading this who have seen the movie Kenny, you will know why this is extra funny. If you haven’t seen Kenny, download it now. Kenneth was sweet on Jill, and he spent the whole game chatting with her and Charla while his clearly long-suffering wife rolled her eyes. We were in hysterics, pretty oblivious to the fact that there was a baseball game going on. 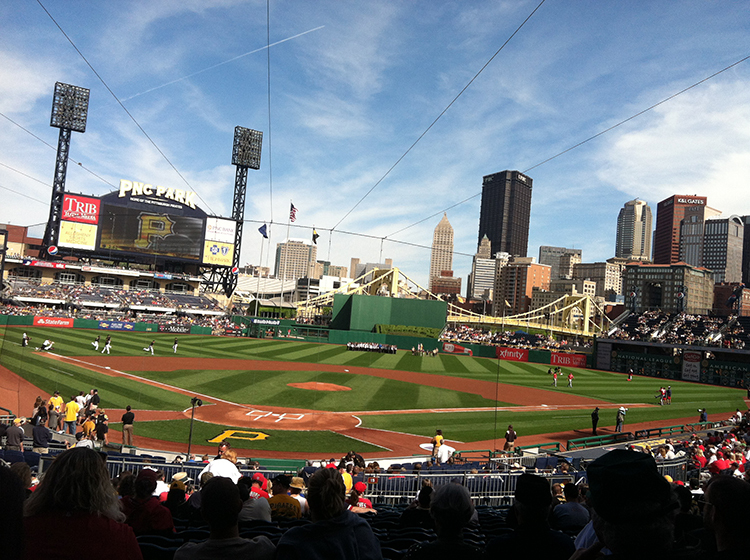 Great ballpark though. Right at the 5K mark. Are we done yet? I had no illusions about this half. I just wanted to finish in less than three hours (my half PR is 2:30; how the not-so-mighty have fallen). I can walk a half in 3:00, so it would be shameful if I overshot that. 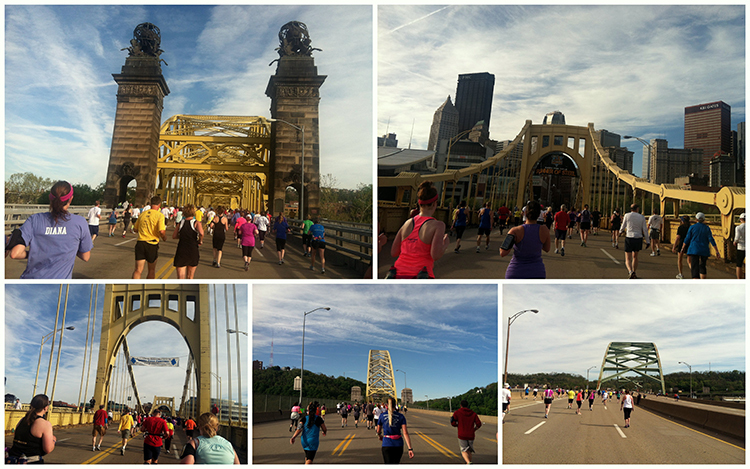 The half-marathon crossed five bridges. I like bridges. Mile 1: Start alongside Charla and Jill and watch them immediately disappear into the crowd (this was Jill’s first half and she did amazingly well. So, that’s what training gets you …). Realize I hadn’t cued up my playlist and spend five minutes fiddling with my iPhone. (You’d think I’d never done this before.) Run slowly. Mile 2: Realize that the new Apple EarPod headphones are useless for running. They keep popping out of my ears. Spend five minutes fiddling with them and cursing Apple for getting rid of the old style (mine broke). Spend another five minutes cursing myself for not trying these new ones out before the race. Run slowly. Mile 3: Realize my watch isn’t showing the distance, only the pace. Spend five minutes stopped on the side of the road fiddling with it. Run slowly. Nice bridge! Mile 4: Run really slowly. Start sticking fingers in my ears to try to keep the headphones in. Nice bridge! Mile 5: Run really, really slowly. I think it’s called walking. Nice bridge! Mile 6: Run really, really, really slowly. Reset watch again. Mile 7: Give up on headphones completely and shove them into my pocket. Now all I can hear is the sound of my breathing. (I have an ear infection so I’m hearing every noise inside my head.) Nice bridge! 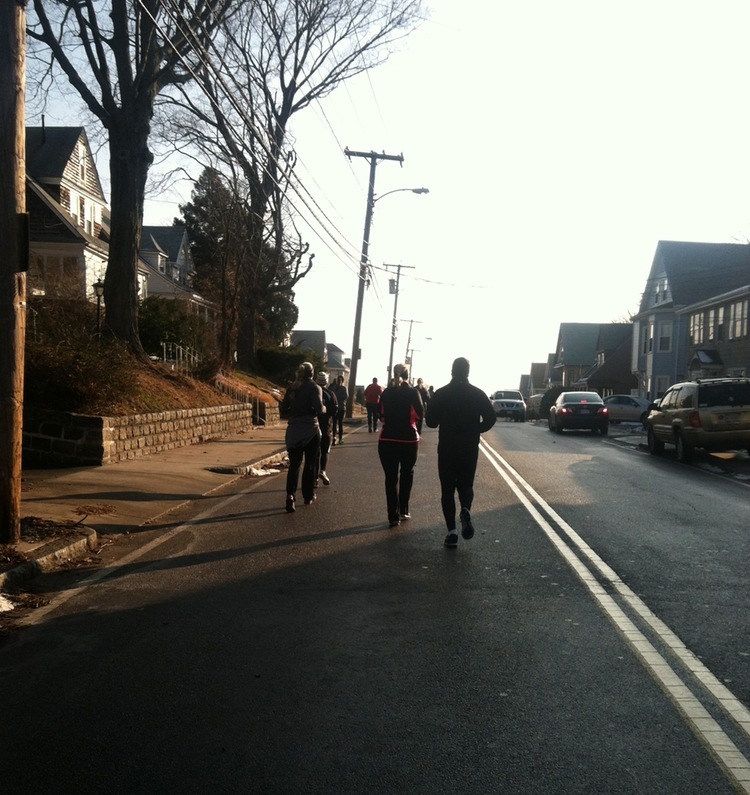 Mile 8-10: Out for a stroll. Lovely day for it. Give up on watch completely. Mile 11: Major mile marker confusion with the marathon. Think I’ve gone farther than I have. Crap. Nice bridge! Mile 11.5: Massive hill. Not unexpected, but still massive. Mile 12: Holy crap, it’s still going. Mile 13: Nice downhill. Think I’m going to breeze into the finish like I’ve been running the whole time. Crowd starts to roar. Realize there are early marathoners coming in. It’s not the first time this has happened to me. Stupid little bonus hill takes the wind out of my sails and I have to walk for a few seconds in front of the crowd. Sadly, no more bridges. 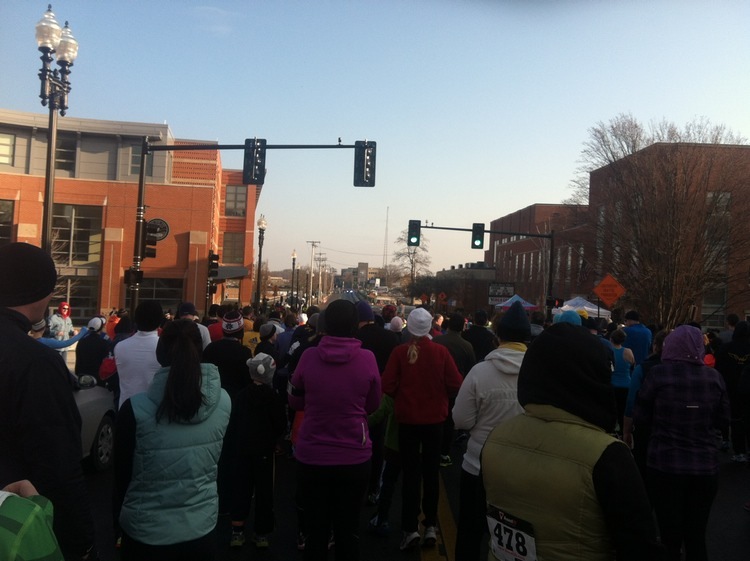 Mile 13.1: Can’t see the cameraman. It’s probably a good thing as I may have punched him out. The aftermath: Smile cookies from Eat’n Park, potato chips, bagels, fruit cups. There was also a huge finishers’ expo but we didn’t partake as it was so crowded, which meant, sniff, no beer. I guess I wasn’t kidding when I wrote at the beginning of 2012 that I needed something to keep running interesting (hence last year’s 52 Weeks, 52 Runs). Two months into 2013 and in the absence of a bona fide wallet-busting, sleep-depriving challenge, I have not only slowed down on the blogging front (wrist slap), but also on the thing I am supposed to be blogging about. 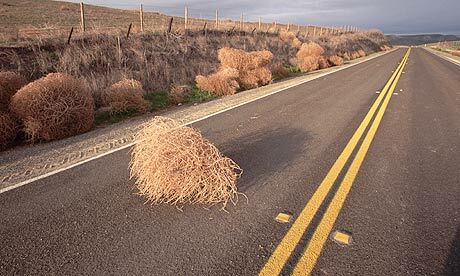 I’m thinking I should rename this blog Stride and Tumbleweeds. It’s probably faster than me over 5K. In keeping with the modern tendency to blame our failings on anyone/anything but ourselves, I have come up with the five causes of my recent lack of Stridery. The Sunday of the Pilgrim we were hit with another storm, and conditions were perilous. We had optimistically picked up our packets the day before, but when we looked outside the morning of, we realized it wasn’t going to happen. Amazingly, the run went ahead, but everything about the conditions screamed “danger!” so we decided not to go. It takes a lot for Hubby to turn down a run. A week later, the Half at the Hamptons was also canceled days in advance due to forecasts of another weekend storm (third in a row). Hubby dutifully went and picked up his T-shirt at the event the race directors held to make up for the disappointment. Sadly, the weather turned out to be OK (if still slightly miserable) on the day, but the organizers made the right call. We’re beginning to amass quite the collection of shirts for which we didn’t do the run (there are also a few from last year). I’m not sure what to do with them. If I wear them, even in the house, I feel like a fraud. 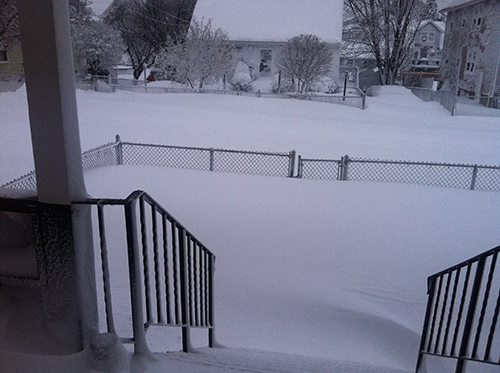 There wasn’t any doubt that Hubby and I were going to do the second Frozen 5K in Quincy, MA. For one thing, it’s right in our ‘hood, meaning we only had to drive for 10 minutes in order to be there 90 minutes before the start. For another, it is hosted by our YMCA, where we go every Tuesday night to be lovingly tortured by our trainer, Mary, in a class called Strength and Stride. Mary and most of our classmates were also doing this run. “… Which brings us back to the delicious descent that helped me feel so (briefly) speedy. Momentously, I had to stop for a couple of seconds at the bottom because I was going too fast, and was perilously close to falling down. But I stayed upright and posted a significantly improved personal record. In a shocking twist, I even felt as though I could go a little farther. OK, so I was obviously experiencing some kind of delirium when I wrote that final bit. But there’s no doubt that it was an epic descent. 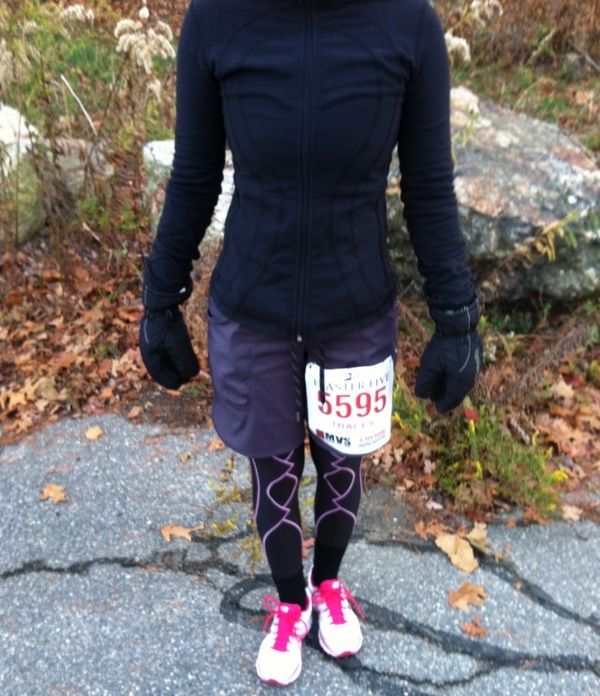 Chilly, but the clouds burned off just before the start. The second mile was better. Not in-the-zone better, but better. Trust me, it’s steeper than it looks. I would have snapped a picture as I was hurtling down the other side, but I was, er, too busy hurtling down the other side. 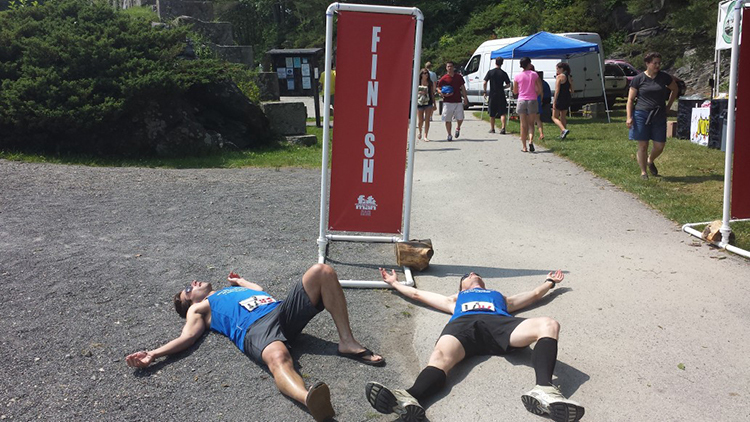 The nice thing about a race you’ve run before is that you know exactly where it’s going to finish. (Better than a GPS any day.) It meant I could go like a bat out of hell over the final quarter of a mile. So bat-like was I that I somehow managed to squeak in under 30 minutes again for only the second time ever. I was very excited. My triumph was extremely hill-assisted, but I’ll take it. Farewell, 2012! Farewell, crazy running challenge! It was a great year, not only because I accomplished a big goal but, more importantly, because I came to meet and know some fabulous people. Thanks again to everyone who read this blog and supported me in various ways throughout the year. You all rock. I’m not sure yet what the new year will bring, but I’m working on figuring it out, and looking forward to sharing my adventures with you. In the meantime, here’s a little 2012 graphical wrap-up, just for fun. Happy 2o13! Hooray! It’s all over! I can’t believe how fast 2012 has gone. When I started this challenge back in January, I (and many others) wasn’t sure how it would play out. Would I enjoy it? Would I get sick of it halfway through? Would my face turn a permanent shade of crimson? Would I wind up trapped under a giant pile of race T-shirts? 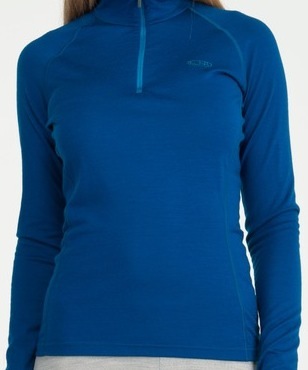 Would I need a Lululemon intervention? There’s something fitting about my last run in the challenge being a race director’s first. We signed up for the All I Want for Christmas 5K in Exeter, NH, because it sounded like it would be one of those fun small-races-for-a-good-cause that I’m always going on about (proceeds to the Hope for Gus Foundation), and because it was in Exeter, which for some reason became our running home away from home in 2012 so it seemed appropriate to end it all there. Colorful gathering on a gray day in Exeter, NH. You never really know what you’re going to get with an inaugural run, especially one that’s so small it doesn’t even have a web presence, but we were heartened to see cars slowly trickle into the Exeter High School the morning of. We, naturally, were among the first to arrive, giving us plenty of time to beat the, erm, traffic and really get to know the parking lot. Despite having 60 minutes to mentally prepare, we neglected to collect our bibs straight away and wound up having to— shock—line up. Hubby busted out the festive attire, which also has neck-warming properties. I mention this because the long bib-pickup line, and therefore slightly late start, was one of the first indicators that this run might have some first-time-event hiccups. The second was the race director telling us that her PA guy had failed to arrive so there would be no microphone. 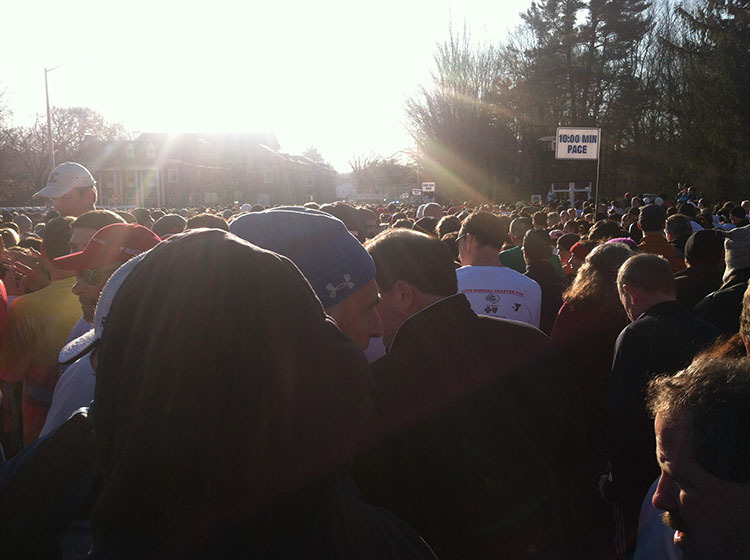 The third was her revelation, as we were lining up to begin, that the course was 3.4 miles long instead of 3.1. Ouch. But no matter. The run felt great at the start despite the chilly weather, and I got it into my head that this was going to be a PR triumph. How awesome would that be, on race No. 52? (Forgetting, of course, that this was 3.4 miles, so it’d be hard to measure.) There was a gorgeous Golden retriever in front of me who was making good time, so I decided she/he was going to be my pace dog.